But what’s happening to the rock on the ice is a science lesson itself. My throw began with my rear foot placed on the hack to provide pushing leverage. I shoved off, gliding on my front slider to guide the 40-pound rock toward the other side of the sheet. Right before releasing the stone, I was supposed to turn the handle, rotating it. The goal is to get the most rocks closest to the center of the circular target. I tried to balance on the rock (wrong move), fell over a bunch, and sweat bullets after all of the heavy sweeping. But the hardest part was just getting the rock to go where I wanted it to. The rock’s bottom isn’t flat, but cupped inward so only a hand-sized, half-inch-thick ring slides along the ice. You’ll notice that before a throw, the thrower will wipe the bottom of the rock to ensure there’s no dust or dirt on that surface, which could potentially change its trajectory. The ice itself is “pebbled” with flat-topped bumps from frozen water. The rock slides straight along the surface. As it slows, it begins to curl, or shift direction. Why that happens is the subject of controversy. Some think scratches on the ice left by the front part of the spinning stone are causing the rear to curl. 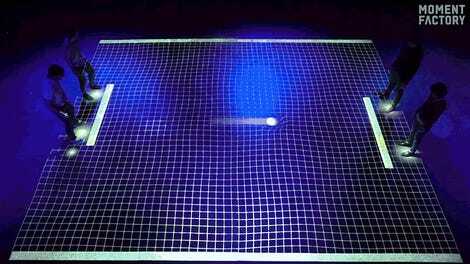 Or perhaps its leading edge is melting the ice asymmetrically, causing it to receive a different amount of friction than the back. Scientists can’t seem to agree. Once the rock is moving, it’s up to the skip, the person on the other end, and the sweepers, the folks with the brooms, to determine whether or not to sweep and how much. Sweeping melts the top layer of ice, decreasing friction. This causes the rock to travel both straighter and further. 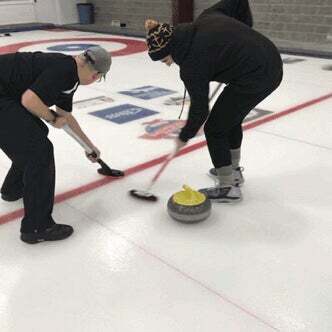 There’s no way to slow a rock down (touching the stone with the broom takes it out of play) but sweeping can add 6 feet to 12 feet to a throw and change the curl by a foot, depending on the ice conditions, Tom Violette, operations associate at USA Curling, told me. Together, the thrower, sweepers, and skip are trying to get the rocks to exact places. They must consider whether they’re going to put them in the middle, knock out the opponent’s rocks, or try and block the house. My partner’s family watched me toss rocks randomly and fall over a lot before we called it quits and ate chicken tenders at Culver’s. 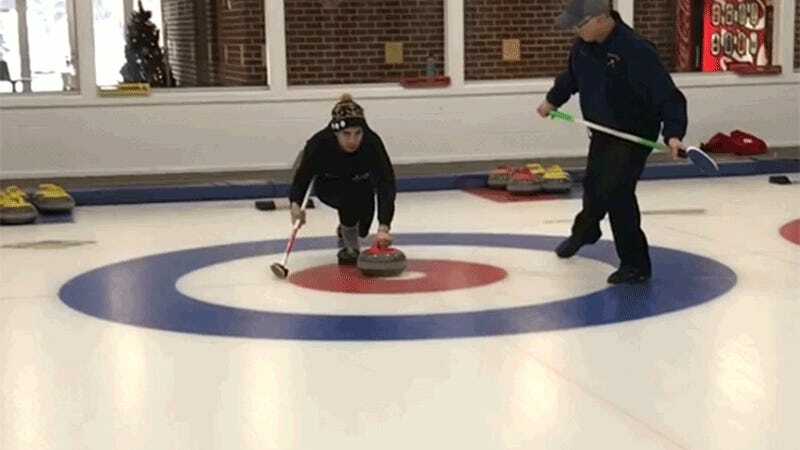 But ultimately, the sport of curling is a complex physics problem. “To explain exactly why the rock acts the way it does is impossible,” said Violette. Essentially, the sport is like putting in golf, except right after the putt, the putter and another teammate are trying to read the green and tell a pair of gardeners whether or not to mow the grass in front of it in order to get the ball exactly where they want it. The sport seems to be having a renaissance, Violette told me. Hometown curler-next-door siblings and olympians Matt and Becca Hamilton have made the game seem like something any old American can do, calling “sick shots” “totally savage.” “It’s obvious that a lot of people are watching it on TV, and the credibility that the media has given to the game has been really nice to see,” Violette said. Even Mr. T is endorsing it. 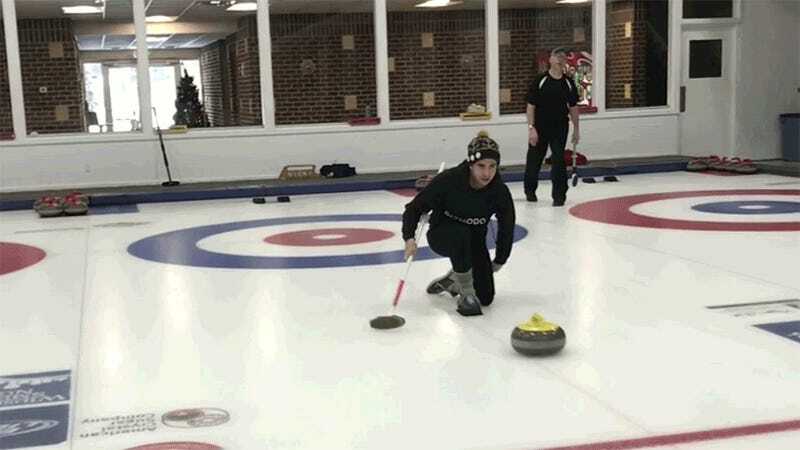 And of course, people are becoming more aware of the spirit of curling—curlers generally call themselves out when they violate the rules, and there are generally no referees policing the game. 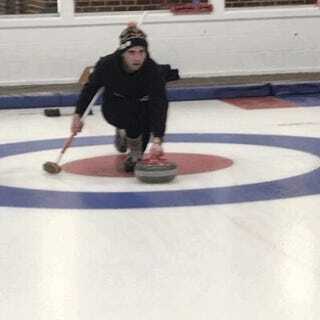 “A true curler would prefer to lose rather than win unfairly,” says a guide to the game from the United States Curling Association. It’s fun. It’s hard. 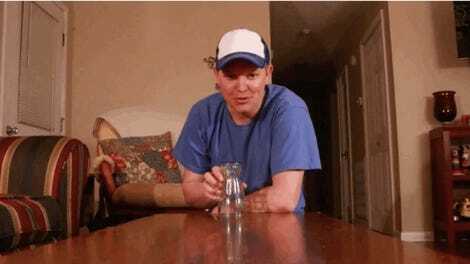 It’s weird. It’s great. Throw enough rocks and you get it eventually, sort of.